The Guest making the reservation is an Adult, and will be an occupant of the property during the entire period reserved. Occupancy of the premises by any additional persons or dog(s) that are not identified in the contract is a breach of this agreement and will result in all occupants having to vacate the property without any refund and may also result in forfeiture of Guest’s security deposit at the sole discretion of SLT. 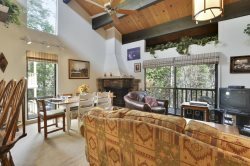 The unit booked coincides with the title of the Property on www.stayinlaketahoe.com. NO PARTIES ARE ALLOWED. RENT: Guest agrees to pay a total of rent based on individual booking. A non-refundable prepayment of $300 is due at the time of booking. Payment in full is due 60 days in advance of Guest’s arrival date. Accepted forms of payment are: check, money order, Visa, Mastercard, Discover. If payment is not received by the 60th day in advance of arrival, the reservation is not considered canceled, however Guest hereby authorizes SLT to charge Guest’s credit card for any unpaid balance. CHECK-IN: Check in is 4:00 PM or later, on the day of arrival. Please do not arrive at your rental property early, unless other arrangements have been made (in writing) with the rental Agent prior to arrival. CHECK-OUT: is 10:00 AM. Late checkouts will be charged $50.00 for each half hour after 10:00 AM, unless a late departure has been authorized by Agent. Please follow the Check-Out procedures listed in the House Book. A $30 per item fee, in addition to the actual cost, will be charged for lost keys, garage door openers, parking passes, HOA amenity/card etc., so please be sure all are accounted for before you leave. Please be sure no items have been left behind, we are not responsible for lost, missing or forgotten items. There is a $30 charge, plus shipping fees, for the return of any item. Guest authorizes SLT to charge for this cost. VACATION RENTAL INSURANCE-CSA: Vacation Rental Insurance has been made available with your reservation. Vacation Rental Insurance reimburses for pre-paid, non-refundable expenses due to certain unforeseeable circumstances that may jeopardize your vacation investment and force you to incur unplanned expenses. We strongly recommend you purchase this valuable protection. If not purchased, you acknowledge you have read and understand our cancelation policy and choose not to purchase Vacation Rental Insurance on behalf of all occupants. Separate terms and conditions apply, read your policy carefully and contact CSA at (866) 999-4018 with coverage questions. VACATION RENTAL DAMAGE PROTECTION: As part of your stay, you may purchase a Vacation Rental Damage Protection plan designed to cover unintentional damages to the rental unit interior that occur during your stay provided they are disclosed to management, IN WRITING, prior to check-out. If purchased, the policy will pay a maximum benefit up to the $1500. Any damages that exceed the $1500 or are not covered under the plan will be charged to the credit card on file. If, during your stay at one of our rental properties, an insured person causes any damage to real or personal property of the unit as a result of inadvertent acts or omissions, the Insurer will reimburse the Insured for the cost of repair or replacement of such property up to a maximum benefit if the policy limit. Certain terms and conditions apply. Full details of the Vacation Rental Damage coverage are contained in the Description of Coverage or Insurance Policy www.vacationrentalinsurance.com/g20vrd . The Vacation Rental Damage plan can be purchased up to, and including at, check-in. By submitting payment for this plan, you authorize and request CSA Travel Protection and Insurance Services to pay directly Stay In Lake Tahoe and amount payable under the terms and conditions of the Vacation Rental Damage Protection plan. Please contact Stay in Lake Tahoe directly if you do not wish to participate in this assignment. Damage Protection does NOT cover intentional damage, theft, Acts of God, gross negligence, pet damage, utilities, rent, pay per view cable, telephone charges, etc. Damage Protection is Not mandatory. In such cases where the Damage Protection Fee us declined by Guest, A SEPARATE CASH DEPOSIT OF $500-$3000 (Depending on Property) will be charged at the time of booking. Deposit amounts vary by property and will be returned within 21 days of departure, less any allowable deductions incurred during the guest's stay. Participation in this plan does not negate Guest's responsibility for damage. Guest is liable for all replacements and repairs except for "normal wear and tear" and Guest hereby authorizes SLT to charge the Guest's credit card to cover said costs in excess of the maximum benefit allowed under any applicable Security Deposit. If cost of replacement or repairs exceeds the Guest's credit limit of Guest's credit card, Guest agrees to pay the difference to SLT. In the event of a dispute concerning a Security Deposit, dispute resolution shall take place in the County where the vacation rental property is located. USE: Guest shall not disturb, annoy, endanger, or interfere with neighbors, nor use the premises for any unlawful purposes, nor violate any law or ordinance, nor commit waste or nuisance upon or about the premises. Any lack of compliance to foregoing use description is a breach of this agreement and as a result all occupants will vacate the property without any refund and may also result a charge of $1000.00 at at the sole discretion of Owners or Agent. SLT is not responsible for the impacts of any event that may occur at a neighboring property (including but not limited to parties, large events, road construction, other construction, etc.) or otherwise close-by; that may adversely affect the Guests peaceful enjoyment of the Property. Loud or unruly behavior is restricted by local ordinance. This property may not be used for weddings, receptions, parties, or gatherings! DOG(S): If the property you have rented is "Dog Friendly" you will be charged a $70 per dog fee, and must e-sign the "Dog Rules" form. Otherwise NO pets wil be allowed in, at, or around the property. If you violate the no Pet policy, your entire group will be evicted immediately and all monies will be forfeited. Any aditional fines imposed by the HOA will be charged to the guest. If you are renting a dog-friendly property, failure to communicare that you are bringing a dog will result in the dog fee of $70 per dog AND and additiional $150 fee, which will be charged to your card or taken out of your deposit. Guests with pet allergies should notify us to verify if pets have been present at the property. Absolutely NO cats, birds, or exotic animals are permitted. PLEASE NOTE: We do not consider service animals “Pets”. RULES AND REGULATIONS: Guest agrees to comply with all reasonable rules or regulations posted on the premises or delivered to Guest by Owner. ABSOLUTELY NO SMOKING BY ANY MEANS OR METHODS IS ALLOWED INSIDE, OR WITHIN 100 FEET OF THE PREMISES, OR IN FORESTED AREAS. If evidence of smoking is found, an additional deep cleaning fee will be charged to the credit card on file or taken from your security deposit. LOCK OUT ASSISTANCE: A $150 may be assessed for lock out assistance after hours. If SLT is not available for after-hours calls a locksmith may be required. The guest will be responsible for the set up and cost of this service. CLEANING: Guest acknowledges that the property is in good order and repair, unless otherwise reported to SLT within 2 hours of check-in. After your stay the home will be inspected. Our cleaning service will perform a departure clean. We request that you leave the home picked up and start the dishwasher or wash dishes and return furnishings to original positions. Please do not make beds that have been used and DO NOT empty fireplace/wood-stove. There is no daily maid service. Your cleaning fee will provide for the normal departure cleaning of your property. Any additional cleaning or excessive linen use will be charged at a rate of $50.00 per hour. Returning furniture to original positions will be a minimum of $250. TRASH: In private homes, garbage collection occurs once per week. Garbage must NOT be stored outside unless it is locked in the designated “Bear Box”.If you have additional trash please call the office. If you are renting a Condominium there will be dumpsters for your use. These may be locked after hours. Additional charges may be incurred for additional trash or if the owner is cited or given a violation for garbage, trash, or refuse not properly stored outside or strewn about the property by wildlife. Further instructions including specific collection day is provided in the House Book located in the property. VACATION RENTAL DISCLOSURE: Renting a single family home or condo is a VERY different experience than that of a hotel. While it is SLT’s intention to provide a consistent family vacation, the nature of the product has its idiosyncrasies. SLT is not open 24 hours a day. However, SLT does maintain a 24/7 emergency line, but we can not guarantee that SLT will be able to be contacted outside of normal business hours. Guests need to be familiar with the general operation of a single family home or condo. Guests must exercise sound judgment; and most importantly, read all posted information at the Property in order to ensure a quality experience. WHAT WE SUPPLY: The Property is, unless otherwise noted on our website, equipped and set up as a fully furnished property that will include bedding, linens, pillows, towels, an equipped kitchen (most have dishwashers), TV including cable/satellite OR internet TV. HOT TUB: IF THE PROPERTY HAS A HOT TUB ~ Guest hereby acknowledges that the property they have reserved includes a hot tub, and is fully aware that the hot tub and surrounding patio/deck can be dangerous; that the deck/patio can be slippery when wet and that injury is likely to occur to anyone who is not careful. With full knowledge of the facts and warnings, the Guest accepts and assumes all risks involved in or related to the use of the hot tub and deck/patio areas. Hot tubs in private homes are serviced and sanitized prior to each arrival, they may be temporarily unusable during guests stay due to normal maintenance procedures required to keep them clean and sanitized. Guests may be responsible for charges over and above the standard hot tub cleaning upon their departure. Please report any maintenance issues as soon as noticed. Hot tubs are prone to temporary or prolonged maintenance issues beyond SLT’s control. Every effort will be made to get the hot tub working as quickly as possible. Refunds for non-operational PRIVATE hot tubs will be addressed on a case by case basis at SLT’s discretion. Refunds for issues with PRIVATE hot tubs will not exceed $25 per lodging night of non-operation – up to a maximum amount of $200. It is extremely dangerous for children, pregnant woman and people with certain health issues to be in and around hot tubs and swimming pools. If you choose to allow any of the above to be in or around hot tubs, you do so at your own risk and agree to hold SLT and the owner harmless. TELEPHONES/INTERNET/TELEVISION: Not all homes are equipped with a landline telephone or internet. A calling card or credit card will be necessary for long distance calls. Guest agrees to pay for all long distance telephone calls or pay per view television charged during occupancy of the premises plus a $30.00 handling fee for any services hired by Guest. High Speed Internet is not always reliable in the Tahoe area. The Owner or SLT is not responsible for the operation or maintenance of DSL or other high speed internet services, regardless of what is or was advertised. Internet may be spotty and may not even work at all due to weather, trees and mountains. UTILITIES & MAINTENANCE: SLT does NOT assume liability, nor offer any refunds, for any inconveniences due to any defects or stoppage in the supply of water, gas, electricity, internet, cable/satellite or plumbing. The Owner or SLT will diligently attempt to address maintenance or utility issues as they occur. If a maintenance or utility issue occurs that cannot be fixed in a reasonable amount of time, and significantly affects the Guests stay; the Owner or SLT reserves the right to refund at their discretion or relocate Guests to another property. UNCONTROLLABLE CIRCUMSTANCES: SLT is not responsible for circumstances beyond our control which includes but is not limited to construction, public or private functions, events, neighbors, wildfire or smoke, weather conditions, road closures, snow delays, natural disaster, acts of God, natural fauna inside or outside of property. We will not offer refunds for these circumstances, which is why we strongly urge guests to purchase CSA Travel Insurance which may cover certain losses. MOUNTAIN AREA DISCLOSURE: (Summer): Forest fires are known to threaten the greater Lake Tahoe region. Controlled or natural fires can create smoke and in extreme cases evacuation. Burn restrictions are often in place; restricting the use of outdoor fire pits and certain BBQs. Our properties do NOT have air conditioning. Wild animals, most notably, bears are present. Appropriate action must be taken to avoid animal problems. Although preventative deterrent action is taken by SLT and the owner of the property during the spring and summer, rodents (most notably squirrels, chipmunks, and mice) and insects (mot notably black ants, carpenter ants, and yellow jacket/ bees) may be present during the summer months inside and outside of the Property. Continuous mitigation of rodents and insects is often necessary and may include spraying, trapping, and other pest control activities. Should a pest problem arise, no refunds will be given until adequate opportunities to bring resolution to the problem have occurred. Subject to the Implied Warranty of Habitability and other terms herein, pest issues are not grounds for re-location or substantial refund. Guests are reminded that they are renting a property that is literally IN the forest and unlike hotels and motels, we cannot always eliminate their appearance. (Winter): The Lake Tahoe Region can be subject to extreme weather conditions. Harsh winter storms are common and may result in difficult if not impossible travel, power outages and other service disruptions. Four wheel drive vehicles and/or chains are often necessary. SLT strongly advises that Guest purchase travel insurance as it may cover certain losses due to weather, natural disaster or acts of God. SLT DOES NOT OFFER REFUNDS FOR ROAD CLOSURES, TOO MUCH OR TOO LITTLE SNOW. SALE CONTINGENCY: In the event the home that you have reserved is for sale, and a party enters into contract to exchange title, the Owner and SLT reserves the right to provide the Guest with a comparable property at no additional cost to the Guest. Showings during occupancy are by appointment only at the Guest’s approval. DISPUTE RESOLUTION: The parties agree to mediate any dispute or claim arising between them out of this contract or any resulting transaction before resorting to arbitration or court action. EXPRESS INDEMNITY: The undersigned, for himself/herself, his/her heirs, assignors, executors and administrators, fully releases and discharges SLT and the Owner of the Property from any and all claims, demands and causes of action by reason of any injury of whatever nature which has occurred or may occur to the undersigned, or any of his/her Guests as a result of, or in connection with the occupancy of the Property and agrees to hold SLT and Owner free and harmless of any claim or suit arising therefrom. In any action concerning the rights, duties or liabilities of the parties to this agreement, their principals, agents, successors or assigns, the prevailing party shall be entitled to recover reasonable attorney fees and costs. Mediation. In the event that a dispute arises that cannot be settled by the parties within five (5) business days, the parties agree to submit the dispute to a mediator within five (5) business days thereafter to resolve the dispute. Mediation fees, if any, shall be divided equally among the parties involved. If any party commences an arbitration or court action based on a dispute or claim to which this paragraph applies without first attempting to resolve the matter through mediation, then that party shall not be entitled to recover attorney’s fees, even if they would otherwise be available to that party in any such arbitration or court action. an action for bodily injury or wrongful death, or for latent or patent defects to which Code of Civil Procedure §337.1 or §337.15 applies. Commercial Arbitration. Any arbitration under this Agreement shall be deemed commercial arbitration, not subject to the consumer arbitration provisions of California Code of Civil Procedure § 1284.3. Attorney Fees and Costs. In the event of legal proceedings, including any arbitration, for the enforcement or interpretation of any of the Contract Documents, the prevailing party in such proceeding shall be entitled to its reasonable attorney fees and costs, including as costs the fees and expenses of the arbitrator(s). If a party prevails on some issues and an opposing party on other issues, the arbitrator or judge, as the case may be, shall apportion attorney fees and costs as is just and equitable in the circumstances. NOTICE: BY EXECUTING THIS AGREEMENT YOU ARE AGREEING TO HAVE ANY DISPUTE ARISING OUT OF THE MATTERS INCLUDED IN THE “ARBITRATION OF DISPUTES” PROVISION DECIDED BY NEUTRAL ARBITRATION AS PROVIDED BY CALIFORNIA LAW AND YOU ARE GIVING UP ANY RIGHTS YOU MIGHT POSSESS TO HAVE THE DISPUTE LITIGATED IN A COURT OR JURY TRIAL (EXCEPT THE RIGHT TO RECORD A LIS PENDENS). YOU ARE GIVING UP YOUR JUDICIAL RIGHTS TO DISCOVERY AND APPEAL, UNLESS SUCH RIGHTS ARE SPECIFICALLY INCLUDED IN THE “ARBITRATION OF DISPUTES” PROVISION. IF YOU REFUSE TO SUBMIT TO ARBITRATION AFTER AGREEING TO THIS PROVISION, YOU MAY BE COMPELLED TO ARBITRATE UNDER THE AUTHORITY OF THE CALIFORNIA CODE OF CIVIL PROCEDURE. YOUR AGREEMENT TO THIS ARBITRATION PROVISION IS VOLUNTARY. PLEASE NOTIFY SLT IN WRITING IF YOU WISH NOT TO ARBITRATE. ENTIRE CONTRACT: Time is of the essence. All prior agreements between Owner and Guest are incorporated in this Agreement, which constitutes the entire contract. It is intended as a final expression of the parties’ agreement and may not be contradicted by evidence of any prior agreement or contemporaneous oral agreement. The parties further intend that this Agreement constitutes the complete and exclusive statement of its terms, and that no extrinsic evidence whatsoever may be introduced in any judicial or other proceeding, if any, involving this Agreement. Any provision of this Agreement that is held to be invalid shall not affect the validity or enforceability of any other provision in this Agreement. The waiver of any breach shall not be construed as a continuing waiver of the same or any subsequent breach. This Agreement shall be governed and construed in accordance with the laws of the State of California.